Players should be at the field no later than 12:30 so we can warm up. Don't forget, this is a county park, so bring the fee for parking. Also, just a reminder, there is no practice on Thursday due to a scheduling conflict so everyone needs to be at practice tomorrow so we can all be on the same page come Sunday! WHEN: 9:30 a.m. Kick off (be there by 8:30 a.m.)! This weekend, we take on Catholic Memorial in the semi-final match for the state tournament. In addition to playing for advancement in the state play-offs, the Founders' Cup is also at stake. This is a big match for the club. DIRECTIONS: Take US 45 North to WI-145 (Exit 48). At top of ramp, take a right, the entrance to Dretzka park is about 1/4 mile up the road on the right. The field is right by the entrance. Our season opens one week from tomorrow, on Saturday, August 30, 2008. This is not only the open match of the season, but also the inaugural Founders' Cup match with Catholic Memorial. Players MUST be there -- in kit and ready to warm up -- at 8:00 a.m. DIRECTIONS: Take I-94 West to Hwy. 83. Exit going north. Nagawaukee Park is on your left just passed the shopping centers. This is a county park so you will need to pay a parking fee, so please have cash on hand. Please note that we are playing all our home games at Waukesha County Parks. I highly recommend buying a parking sticker for your car. The County park system has been very good to rugby so please--support our Waukesha County Parks. Just a reminder... pre-season practice starts Monday morning. Don't forget to bring your mudguard to practice!! Coming up soon... our first pre-season match (and inaugural Founders' Cup competition), Saturday morning, August 30, 2008 against Catholic Memorial at Nagawaukee Park. Follow the link under "welcome" to go to the google-group and download registration paperwork. Follow the link under "Fall 2008 Season" to see the full fall schedule. For those of you wondering, here is an image of the Founders' Cup --prior to engraving -- which will be on offer each time our A-side plays Catholic Memorial. The scores of each match will be engraved on the base and the trophy will be retained by the winning team. Our Club has a 1-2 record against CMHS. This past spring we lost by only 2 points and were only 5 meters from scoring the winning try at the final whistle. This should be a very competitive and very friendly rivalry. 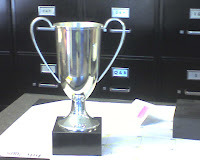 I am confident that we can kick-off the season by bringing home some hardware after August 30, 2008 match against CMHS. Practice starts soon! We will be holding a recruitment/season kick-off picnic. 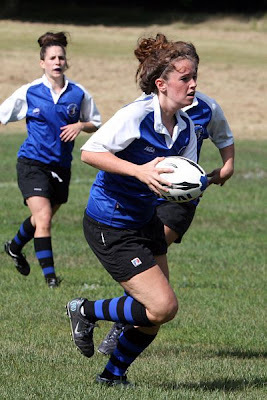 We'll be getting together, having some food, playing a little touch rugby, demonstrating some contact skills, and sharing the details for the very exciting Fall 2008 Season. WHO: NEW and Returning players. Remember, no experience necessary. Come find out what it's all about. Well the terms have not been finalized, but the Bruisers have been challenged by Catholic Memorial High School to formalize our rivalry by the exchange of the Founder's Cup -- a rivalry modeled on the Bledisloe Cup, a competition between neighboring rivals New Zealand and Australia -- who exchange a trophy each year based on test matches between the two nations. While the formal details are still be negotiated, this new competition will result in the exchange of a trophy between our two clubs and formalize a great cross-town rivalry -- even if the games are "non-conference games" or the games are played during the Spring season. If things work out, our pre-season match up with Catholic Memorial should be the inaugural match of this new competition. The Bruisers had a bruising weekend, as 8 of its finest, battled through the Lakefront 7's bracket against St. Charles, Il and two squads from Vernon. The Bruisers defeated Vernon 1 in the opening match, but suffered an injury in the final minute as the match ended. Brookfield, now out of substitutes, put up a stiff resistance against Vernon's second side, but suffered a second injury, and played with a 6 person side. But even out numbered, Brookfield rallied to put points on the board during its loss to Vernon 2. In the final match, Brookfield faced a fresh and fit St. Charles team which swept the competition. The final results came out today and Brookfield took second place, with it's 1-2 record, based on point differentials! Go Bruisers! The Milwaukee RFC hosts it's annual Bach Front 5s tournament on Bradford beach on July 26, 2008. The tournament stats at 10:30 on Saturday and runs through the afternoon. Teams play 5 v.5 in the sand on the beach. Rosters are limited to 7 players, but we can enter multiple teams if there is interest. 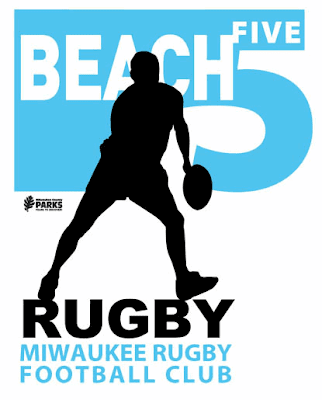 There are full rules and tournament details on the Milwaukee RFC website. Email me and let me know if you are interested. The cost per player will be $15. Let me know if you have any questions. We're heading down to Veterans Park in Milwaukee this weekend to compete in the Lakefront 7s tournament. We'll be leaving from the Flemmings parking lot at 7:15 a.m. this Saturday! The tournament runs from 8:00 a.m. until 6:00 pm., but we won't know specific game times until we arrive at the field. We'll be competing against teams from Vernon and from St. Charles, Il. It should be a good day to run around in the sun. The Wisconsin Women's U19 Selectside will be playing an exhibition match against the Indiana Women's U19 selectside this Saturday at the Churchill Cup, an international competition featuring USA Eagles, Argentina, Canada, Ireland, England, and Scotland. The match time is set from 2:10 to 2:45 p.m. at Toyota Park in Bridgeview, IL. If you are interested in going down to support our Wisconsin selectiside, contact the U19 select coach, Scott Prunkle at u19selectcoach[at]gmail.com for more information. Congratulations to our representatives from the Brookfield Bruisers: Elizabeth Perry, playing flanker, Valerie Seidl, wing, Cari Berdan, second row! It is really great to see so many of our Bruisers representing Wisconsin! Good luck! Here is the schedule for the Fall. 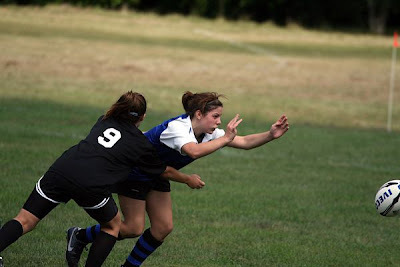 Just to keep your ball handling sharp (and introduce potential rookies to the sport), we will be holding informal practices to just play tag-rugby (non-contact) one night per week. Any player, potential player or even mildly curious friend is welcome to join us. The Fall season schedule will be posted within the week so check back to see the details for our pre-season practices and Fall match schedule. And remember... the off-season is the time to focus on personal fitness. By our individual efforts, we are collectively stronger. It was a great end to our season with a win under the lights at home. The Bruisers dominated the visiting Norhshore team with an impressive 47-7. The A-side victory was a great way to close the season, as the Bruisers set their sights on the fall conference schedule. The B-side struggled to stay on the board, suffering a 20-0 defeat. 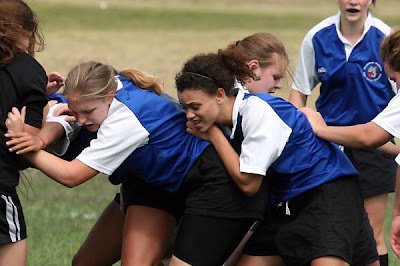 Although the B-side was not able to put points on the board against the athletic Northshore B-side, the Bruisers were dominate in the rucks and demonstrated a lot of clear potential for the fall. If anyone has pictures lets post them. The B-side provided the Club with a thrilling win this past Sunday when it defeated Muskego 17-12. The B-side held a slim, 2-point lead for most of the first half, thanks to the conversion kick by Tristan. The game was a defensive battle, as the B-side played strong defense, deep within its own 22-m line, repeatedly warding off the Muskego attacks. The game came down to the final minutes, when Kassie, playing fullback, made a game saving tackle to stop the 50 meter break away run by Muskego. The team reorganized a counter offensive and pushed down the field in the closing thirty seconds of the game to prevent Musekgo from touching down the tyring try. It was some very exciting rugby. Our B-side is on a winning streak! I should point out that the B-side lost to both Fond du Lac and Muskego at the start of the season. In the past 2 outings, the B-side have reversed both these losses! Way to go! WHO: Muskego-B v. Brookfield B. If you are an A-side player, you should still attend the match because (1) let's support our B-side and (2) you never know what subs we will need! DIRECTION: Take Moorland past Janesville Rd. going south. You will come to a four way stop (stop signs, this intersection is Woods and Moorland/Durham), continue south through the stop and about a half mile down on your left will be McShane Dr. Take a left here and the pitch will be on your right hand/south side about a half mile down the road. Finally! Some pictures from our trip to mud-pit Iowa. Here's our team before we played our game in the mud pit. This is the actual core of the mud pit where we attempted to scrum. Key word: attempted. Our team after the coldest, dirtiest game of my life! Enjoying the freezing cold mud I guess? It was all good times this spring season. Whether it was in the mud pit or on the good field, we Bruisers held our own. Directions: Take I-94 West to Hwy. 83 exit in Delafield. Take Hwy. 83 North about 1/2 mile (i.e. until you pass all the shopping centers). Nagawaukee Park is on the left (west) side of the road. You can see the goal posts from Hwy. 83. Please note that Nagawaukee is a county park, so you will need to pay a per car entry fee if you don't have a county parks sticker. 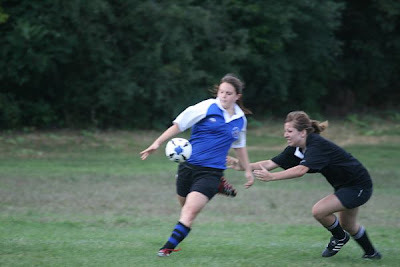 This is just a suggestions, but if you are planning on playing rugby in the fall, I would recommend buying a county park sticker, as 2 of our opponents (KM and CMH) have home fields located on county park grounds and play-off games in the Fall are again likely to be played at Waukesha County parks. Therefore, you can anticipate paying this fee 3-5 times per year, which will make a sticker more cost effective. Just a quick reminder about Saturday's game against Muskego. We are playing at Brookfield Central. Players must be at the field at 3:00. We should be kicking off the A game at 4:00 with the B-game kicking-off immediately after the A-game concludes. Club officers will be organizing the post-match social. We are playing 2 games this weekend. B. v. Oak Creek and B. v. Fond du Lac. The games are back to back, starting at 1:00. We need to be at the field NOON on Sunday to warm up. For rookies, please be aware that following the two matches, the host team will provide some food. All players are expected to socialize with the opposing side after the match, so please plan your time accordingly. Travel South on I-94 towards Chicago, pass General Mitchell Airport Exit, pass College Ave exit. Take Rawson Exit on the right. Turn left on Rawson, going East (Pass Farm and Fleet on the right) – next stop light is Howell Ave. Turn right on Howell Ave going South (Pass Woodman’s on the right – second Stop Light after Woodman’s is Puetz Ave). Turn left on Puetz Ave, going East, Oak Creek High School will be on the left. Just past the school is an entrance to the Parking Lot at the back of the school. Park there the Field is on the East Side of the lot. Bring something to sit on…. There are no bleachers. There is a parking area behind the High School. You will see Two Baseball/Softball diamonds. I am setting up the field between the two diamonds. Starting Wed., April 16, our practices will move to Brookfield Christian School, which is across the street from Brookfield East. Thurs: from 4:00 to 5:30. It was a hard loss as the Bruisers fell 24-22 to Catholic Memorial on Friday night, under the lights at Brookfield Central High School. Despite the weather taking a toll on the early practices, the Bruisers made an impressive stand against Catholic which was fresh from its tour of Ireland. 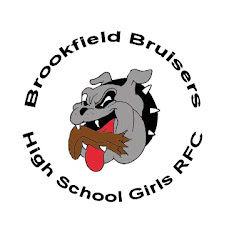 The Bruisers played to the last whistle, and the match ended with Brookfield in possession and driving forward within 10 m of the CMH try-line for what would have been the go-ahead score. Conversions: Lauren F. (1); Dana A. (1). 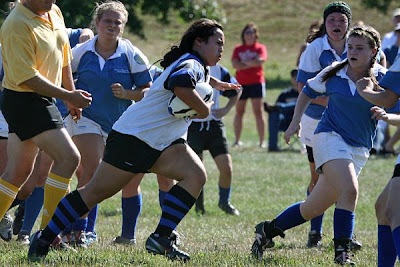 This weekend, the Bruisers will take on Catholic Memorial for the open match of the Spring 2008 Season. This will be our first game, under the lights at Brookfield Central's stadium and should be a great opportunity to show case the team. We need to be at the field, ready to warm up at 6:00 p.m.! Let's make these next to practices count and be ready for a great start to the season. DUE TO THE THUNDERSTORMS, THERE WILL BE NO PRACTICE TODAY (MONDAY, MARCH 31). See you all on Tue. and Thurs. at 4:00 at Mary Knoll Park! Due to the cold and the impending snow, we are cancelling practice on March 27 and 28. Practice will take place next week Mon. Wed. Thurs. (our normal practice nights) from 4:00 p.m. to 5:30 (shortened due to the temperatures) at Mary Knoll Park. Practice next week will be held no mater what the weather. Currently, our home field (Brookfield Christian) is still very muddy and cannot sustain the wear on the field for practices. In addition, I have several work commitments that will keep me from attending our scheduled practices over the next few weeks. Therefore, I am publishing this revised practice schedule in hopes that we will be able to have practices over during the Brookfield spring break. Please note that this practice schedule will provide us with 6 practices prior to our game with Catholic Memorial and only 9 practices prior to the Iowa trip. Practice attendance is imperative. That said, I understand that during spring break and with a changed schedule, attendance may not work for some players. During the week of Spring Break we will practice Tuesday, March 25, Thursday, March 27, and Friday, March 28 from 4:00 to 6:00. The location is to be determined. I am working on an alternative field location and should have an answer by the end of next week. We will resume our regular practice schedule (Mon., Wed. Thurs.) beginning on March 31. I will let you know as soon as I find out the location of our practices. I would note for new players, that the Fall season is not so haphazard as the match schedules are established for conference play and we do not have the same problems with weather and field conditions. Follow this link to the updated Spring 2008 Schedule. 1) We have moved the date and time of the games against Muskego and Catholic Memorial so that those games can be played at the Brookfield Central High School stadium. We believe this is a great opportunity to increase the profile of our team in the community. 2) We have added a tentative game against North Shore in May. This game may also be played at the Brookfield Stadium, subject to confirmation. Otherwise, we will be playing the game during that weekend. Here are some of the highlights of what we discussed at the pre-season meeting on Tuesday night. We are making progress on incorporating the club and achieving not-for-profit status. We should be incorporated within the next week, thanks to our three brave volunteers who agreed to fill the initial board spots: Jeff Faulkner, Larry Stitch and Neal Anderson. Over the next month or so, the Club will be soliciting volunteers to fill committee positions which will spread the work of running the club and help create a stable future for the program. We still need additional drivers for the Iowa Tournament, on the Weekend of April 11. The team will drive to Des Moines Friday evening, play 2 games Saturday, one game on Sunday, and drive home Sunday afternoon. We have transportation for approximately 15 players. Please email me, if you are interested in driving. We have added two new coaches to our staff, Matt Pinsoneault and Bill Gerking. This should enhance our ability to move the team forward, especially in the absence of Coach Simek, whom we will hope will be returning in the fall. Please note that the dues are due on or before March 17, 2008, or there will be a $10 late fee. You can either mail registrations to my home address, which is in the registration packet, or give the forms to me at the pre-season practice. We are officially considering a tour to the United Kingdom (Wales and England) for the Spring of 2009. We anticipate that the total cost will be about $1,500 to $2,000 and would likely travel over the Elmbrook School District's spring break. Registration forms for the Spring 2008 season can be found at our google-group. If you are new to the club, you can follow this link to the google group and request membership so that you can access the forms. The spring schedule is posted on the Blog here. With the final results in, Purple and Scarlet tied for league points. In head to head competition, Purple and Scarlet traded victories. The final tie breaker is higher differential between points scored versus points against. Despite the very close competition, Scarlet edges out Purple to win the innaugural Brookfield Tag Rugby Cup. I hope that this is the start of a new, fun tradition. If players have any comments on how the Tag Rugby "season" went, please let me know. This was a first run for us and I am sure there is stuff we can improve on. I was very pleased with the level of creative ball handling and support running which I saw on the field. Now, let's get ready for Spring! We will hold a pre-season meeting to share our plans for the spring and make sure everyone has all the relevant information. If you know someone interested in playing or curious about learning more, this is a great opportunity to bring them along. As always, no experience necessary and all new, returning and even merely curious players and thier parents are welcome. For those of you who are interested in the details of the Iowa rugby festival, which is part of our spring schedule, you can check out the Des Moines Rugby Club website and follow the links to the U19 Festival. This should be a great opportunity to test ourselves against teams from other states. Parents, please don't forget to contact Dan to volunteer to chaperon/drive. I've been a bit delayed posting scores from our tag league, but here they are. Week 1: Scarlet defeated Gold 40 v. 17 to earn a 4 pt. win. The Blues fell to Purple in a close match 42-35, earning the Blues 1 bonus point for a loss by 7 or fewer points and 4pts. for Purple. Week 2: Purple again edged out its competition and Gold walked away with the a bonus point for a close loss, with tine final score 35-32 in favor of purple. Scarlet posted a big win over the Blues 59-37. Week 3: With the snow keeping a lot of players home, combined sides were the norm. A very understaffed Blues team fell to Gold 71-53. The upset of the night came a Purple defeated Red 81-44. With 3 weeks left to play, every team will get a re-match, so the field is still wide open as the first Brookfield Tag Cup competition heads in to the second half of the season. Friday, April 4: Brookfield A v. CMH at Brookfield Central High School at 6:30 p.m.
April 12-13: Iowa Invitational Tournament. (PARENTS: We will need voluntter drivers and chaperones) in Des Moines. Sunday, April 20: Brookfield A v. Oak Creek and Brookfield B v. Oak Creek/FDL; 1:00 p.m. at Oak Creek. Saturday, April 26: Brookfield v. Muskego at Brookfield Central High School at 3:00 (A + B games). Sunday, May 4: Brookfield v. Vernon and Brookfield B/FDL v. Vernon-B at Vernon. 1:00 p.m.
Sunday, May 11: Brookfield v. KM and Brookfield B v. KM-B/FDL at Nagawaukee Park at 1:00 p.m.
Saturday, May 17: Minnesotta v. Wisconsin Rugby Festival in Mauston, WI (hosted by KM). Details to be confirmed. Friday, May 30: Brookfield v. Northshore at Brookfield Central High School at 6:30 p.m. (TENATIVE -- may be moved to a Saturday game). If you are looking for ways to better visualize what we try to do on the field, the Rugby Channel plays a clip of the week. I highly recommend watching some rugby now and then on-line to help broaden your perspective and enjoyment of the game. We held our first board organizational meeting on Tuesday and we are moving forward with plans to incorporate the club. Our short term goal is to achieve not-for-profit status in the next 18 months. Over the long haul, I think having a formal board structure should promote growth and increase stability for a more successful club, both on and off the field. Over the course of the next season, we will be looking to fill vacant board seats. The proposed version of the by-laws call for a 7-member board. I am sure our newly appointed board would welcome volunteers. Our winter season starts on Monday, January 7, 2008 from 3:30 to 6:00. If anyone still needs directions to the Brookfield Indoor Soccer Complex (the BISC), they can be found at the BISC's website. I hope everyone had a good holiday. Hopefully this will be a fun way to shake-off the dust from the winter and get back in the swing of things before the Spring.